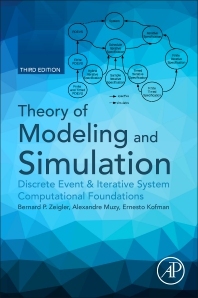 Theory of Modeling and Simulation: Discrete Event & Iterative System Computational Foundations, Third Edition, continues the legacy of this authoritative and complete theoretical work. It is ideal for graduate and PhD students and working engineers interested in posing and solving problems using the tools of logico-mathematical modeling and computer simulation. Continuing its emphasis on the integration of discrete event and continuous modeling approaches, the work focuses light on DEVS and its potential to support the co-existence and interoperation of multiple formalisms in model components. New sections in this updated edition include discussions on important new extensions to theory, including chapter-length coverage of iterative system specification and DEVS and their fundamental importance, closure under coupling for iteratively specified systems, existence, uniqueness, non-deterministic conditions, and temporal progressiveness (legitimacy). Bernard P. Zeigler, is a Professor of Electrical & Computer Engineering at the University of Arizona and co-director of the Arizona Center for Integrative Modeling and Simulation. He is the author of numerous books and publications, a Fellow of the IEEE, and of the Society for Modeling and Simulation International. Zeigler is currently heading a project for the Joint Interoperability Test Command (JITC) where he is leading the design of the future architecture for large distributed simulation events for the Joint Distributed Engineering Plant (JDEP). He is also developing DEVS-methodology approaches for testing mission thread end-to-end interoperability and combat effectiveness of Defense Department acquisitions and transitions to the Global Information Grid with its Service Oriented Architecture (GIG/SOA). Alexandre MUZY is research fellow at CNRS, France, where he is in charge of the research group Modélisation, Simulation & Neurocognition (MS&N) at I3S laboratory in Sophia Antipolis. Ernesto Kofman is a Professor at the Control Department at the Faculty of Exact Sciences, Engineering and Surveying of the National University of Rosario (FCEIA-UNR) and a Research Member of the National Research Council of Argentina (CONICET) , where he is in charge of the Simulation and Automatic Control Group of the French-Argentine International Center for Information and Systems Sciences (CIFASIS).